After attempting to make the lovely parippu tonight, I accidentally made this instead. How? Well, with almost my entire body in a cupboard searching for split red lentils with no success, I discovered a huge container of brown lentils I’d never used. I immediately abandoned the parippu in favour of a made up dal. I’m sure it’s quite authentic in some far flung part of India, but it’s by happy coincidence if it is. I must say, it was truly delicious. Lovely and nutty and flavoursome. Pick over the lentils for stones. Put them in a large heavy based pan. Add the tomato, onion, chillies, cumin, coriander, turmeric, cinnamon stick, salt and chilli powder and cover with 1 litre warm water. Bring to a boil then simmer, covered for 30 minutes. Remove the lid, and simmer for 10-15 minutes. to reduce down the liquid till almost dry. 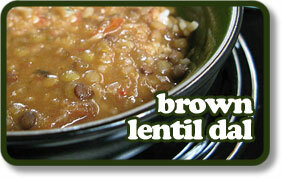 Check that the lentils are soft but not too mushy. Cook for longer if necessary, adding a little more water if needed. When done, remove from heat. Heat the oil in a small pan until hot. Pour in the mustard seeds, and put on the lid, after they stop popping (10-20 seconds) take off the lid and add the curry leaves. Quickly stir and add the onions, fry over a high heat until they are browned around the edges, for about 2-3 minutes. Remove from the heat the tip the onion mix into the dal and stir in along with the cream. Heat over a medium temperature until it comes back to a simmer then remove from the heat. Pick out the cinnamon then stir in the lemon juice just before you serve. Serve with breads or basmati rice.